We welcome people from all denominations and locales to this parish. Saint Michael's is a strong, faithful and growing intergenerational congregation whose ministries are enriched by visitors and parishioners. Whether you are here for a week, a season, or year-round, we welcome you to this household of faith and we invite you to make this your home. We welcome you to join us again this season as we offer you nourishment in the way of inspirational musical presentations, concerts, and speakers. All five senses are invited to take in the beauty of God’s creation as we seek to walk our earthly pilgrimage together. There is no cost for these offerings. All we ask is that you bring a donation of non-perishable food as we continue to support the many hungry people on the islands and in the Fort Myers area. Worship Saturday, April 13th at 5:00 p.m.
and Sunday, April 14th at 8:00 & 10:30 a.m.
An ancient Holy Week service of light and shadows, candles and scripture. "Maundy" is derived from the Latin mandatum novum meaning "new commandment." The Reserved Sacrament will be placed in the Angel Chapel for an all-night vigil for anyone wishing to come and pray. This day commemorates the crucifixion of Jesus. The liturgy includes the Passion Gospel, solem collects (dating from ancient Rome), and Holy Communion from the Reserved Sacrament from Maundy Thursday's Eucharist. The Book of Common Prayer offers us a service of scripture, a spoken anthem, and the Lord's Prayer for the first service on Holy Saturday. There will be a celebration of Holy Eucharist at this service. Following the service, there will be a potluck supper. St. Michael & All Angels Episcopal Church presents a four-hand piano recital 6 p.m., Wednesday, April 24, at the church. 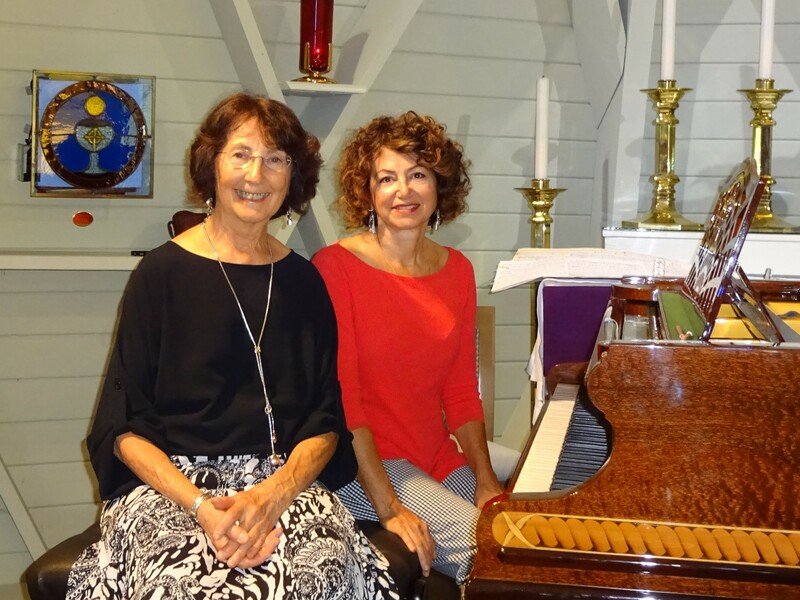 The recital, part of the St. Michael’s “Nourishment for Body, Mind and Spirit” series, features pianists Roxane Olevsky and Jan Holly in their fourth appearance at the church. Born into a family of concertizing musicians, Roxane Olevsky was surrounded by music from an early age. She began teaching guitar and piano in high school, after which she earned degrees in Piano and Vocal Music Education at the University of Massachusetts, Amherst, studying with Swiss pianist Fernande Kaeser. She also studied at Les Écoles d’Art Américaines in Fontainebleau, France, with world-famous music theorist Nadia Boulanger and pianist Jean Casadesus, and sang in choirs with such renowned directors as Robert Shaw. Her first love remains teaching individual and class piano—she operated a successful piano studio in Massachusetts for over 30 years. She maintains a piano teaching studio on the Island. Jan Holly holds a bachelor’s degree, in piano performance, and a master’s degree and Ph.D., in musicology. She has devoted her professional life to the training of musicians in both college and university settings. For 25 years, she was a collaborative pianist and accompanist for college and community choirs. She currently teaches online music courses in music appreciation, world music and American popular music. A specialist in piano pedagogy, she operated a piano studio for 30 years, applying the Taubman/Golandsky method to technical challenges facing adult learners. Holly writes for the Santiva Chronicle and Times of the Islands, and is a public relations consultant. Vice President of the Committee of the Islands’ Board of Directors, she also serves on the Big Arts Classical Music Committee and Classical Music Scholarship Committee. Holly is Saturday and summer organist at St. Michael’s. She also lectures occasionally on musical topics. The recital, which is free and open to the public, is followed by a meet-the-artists reception in the Church’s Parish Hall. For more information on services and special events at St. Michael & All Angels Episcopal Church, contact the Church Office, 2304 Periwinkle Way, 239-472- 2173 / saintmichaels-sanibel.org. so that all may come to know God. therefore, we will care for others in the name of Christ. therefore, we will volunteer our time and talents. therefore, we will share the gifts God has given us. therefore, we will strive to include everyone. therefore, we will treat each other with respect and honesty. ♦ Women of the Church (ECW) Informative programs on 2nd Mondays at 12:30 p.m.
For more information about our Lenten opportunties and Easter Services click here or scroll down this page. 1st Wednesdays at 6 p.m.
3rd Wednesdays at 6 p.m.
Home | Admin © Copyright , St. Michael's Episcopal Church. All rights reserved.